1 lb breakfast sausage – Tube sausage, or get fresh stuff from Whole Foods or somewhere and squeeze them out of the casings. I like sage in my breakfast sausage. 1. Simple. Here’s all you do. Carefully and evenly cover each of the eggs with sausage. Put them on a plate or a tray as you cover them, and stick them in the freezer for about 15 minutes. 2. Crack the eggs into a bowl and add the Worchestershire sauce and whip up until it’s all mixed in. Have the bread crumbs in a separate bowl. 3. Take out the eggs, and one at a time, dip them in the egg/sauce mixture and then the bread crumbs. Throw them in the deep fryer at 365 for about 5-7 minutes, until the Scotch eggs are browned all over. Let cool about 10 minutes before serving. Serve whole or sliced in half (the long way) with spicy brown mustard, hot sauce, or just by itself. Great the next day hot or cold, and perfect to take on a hike for an afternoon snack on the first day. Some friends of our have done “Bar Food Night” a few times, and this seems like a natural fit. Fried meat-wrapped meat. Perfect! 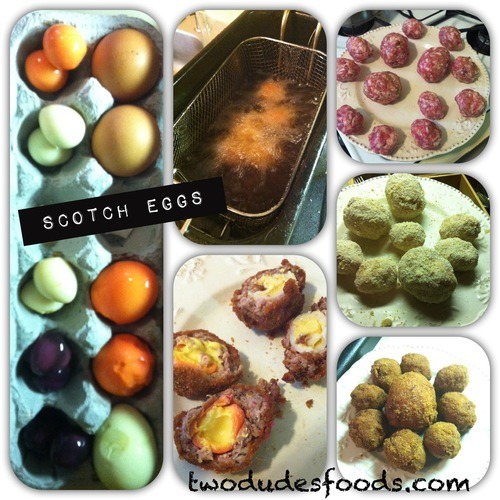 And I finally get to knock Scotch Eggs off my bucket list! Of course, you don’t have to pickle the eggs first. Any hardboiled egg will do. I just like the flavor the pickled eggs add to the mix.